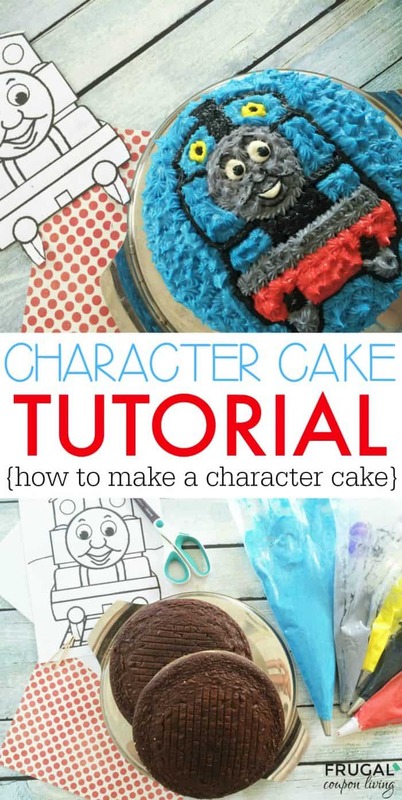 The simplest Character Cake Tutorial. 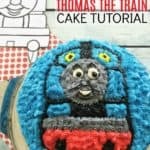 We made an easy Thomas the Train Cake for our train birthday party theme, but this cake can be done with your child’s favorite character including Elmo, Paw Patrol, Dora and more. Have you ever seen a cake at a party and thought they must have spent a fortune, then to find out the hostess made the cake themselves. I am always impressed by people’s talents only to find out that some things just aren’t as impossible as I think. With the dawn of Pinterest, Instagram and more, creative food crafts are much easier than one would think. 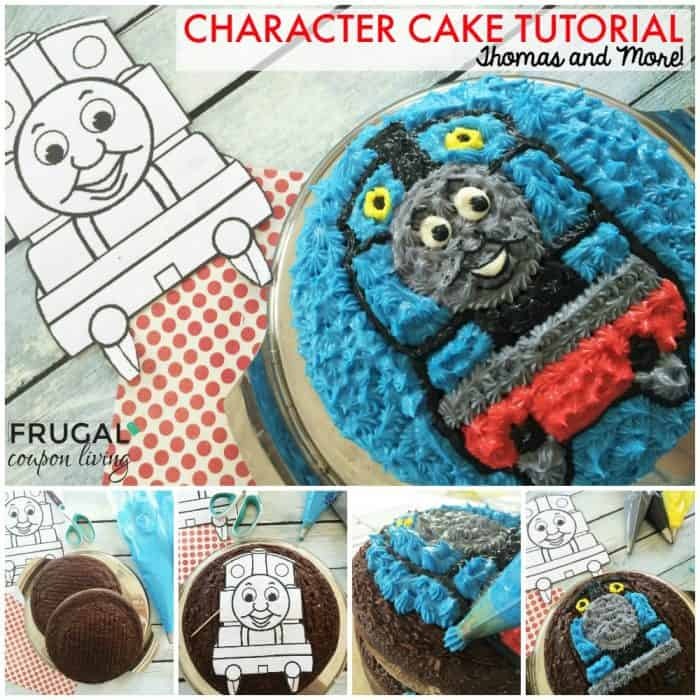 We had fun with this Thomas the Train Character Cake*. Using a coloring sheet and some creativity, we made this cake look like a million bucks! 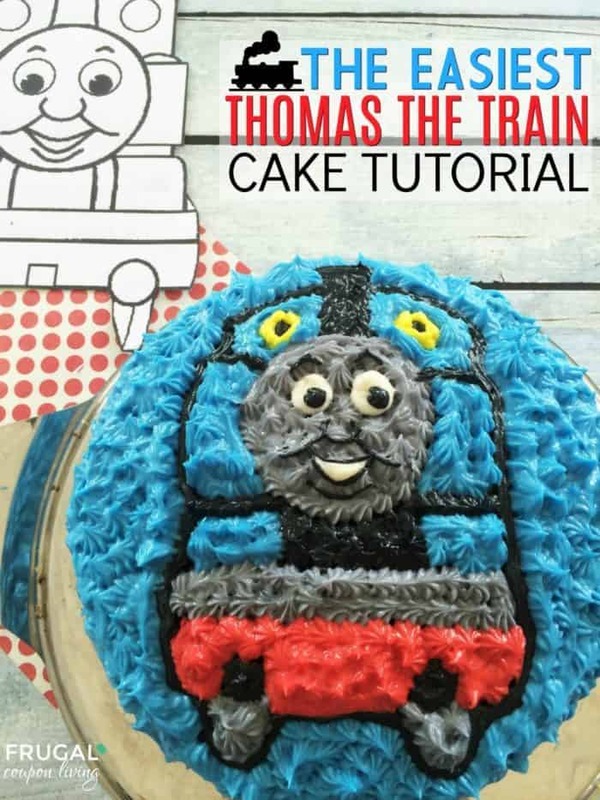 Follow our steps with Thomas and make your own character cake to fit your party’s theme. *In retrospect, I wish I would have done white on the outside instead of blue because it would have made Thomas stand out more! Find the image of the character you want (I just Googled ‘Thomas the Train coloring pages’), like I said, and go for simple and easy when choosing! Print out the image, then resize it according to the size cake you want to make. Be sure to have 2 images printed out. You will be cutting one up and using the other one as a reference guide. After you have baked your cake and its cooled and your frosting is prepared, divide up the frosting and add the food coloring according to your character’s colors. Place colored frosting in frosting bags with tips. Cut out your image around the border and place on the cake. Pick up image and cut along a different border in the image, working your way inwards, align to the traced edges you just did and trace a little more with the toothpick. Once you have all your lines traced, use your other image as a guide (because it can get a little confusing just looking at all the lines and trying to figure out what is what), and start filling in with colored frosting! I used the simple dot method to fill in and find this the easiest and most effective way. This Cake Sizing Chart from U Create is very helpful when deciding the size of your character cake! 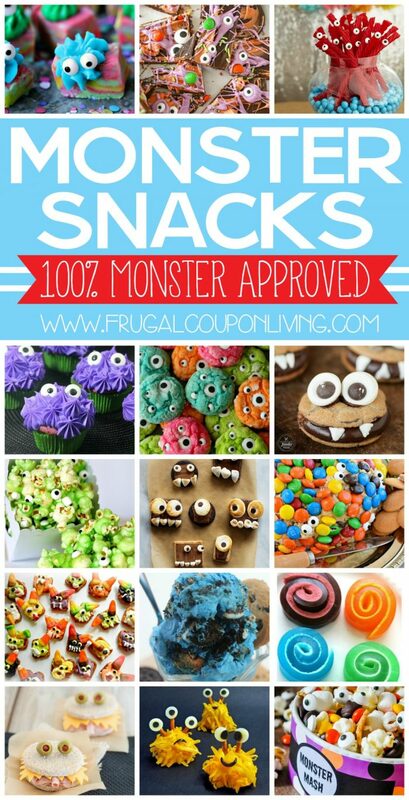 Also take a look at our Monster Snacks for Kids and Monster Party Ideas. Pin to Pinterest. Also enjoy one of our favorites, Cookie Monster Ice Cream. Pin to Pinterest. Still looking for the perfect patriotic shirts to wear on the 4th of July? I love all of these fun 4th of July Tees and Tanks. Right now, you can get these for $13.99, down from $27. These unisex tees and racerback tanks are made of super soft fabric. They come in a variety of holiday-themed designs like “Stars and Stripes”; a red, white and blue pineapple; a map of the United States and “Love my Country.” I’m loving the “American Mama” tee, and that’s one you could wear year-round! Pair these with your favorite jeans or shorts on the 4th of July for an easy patriotic look. 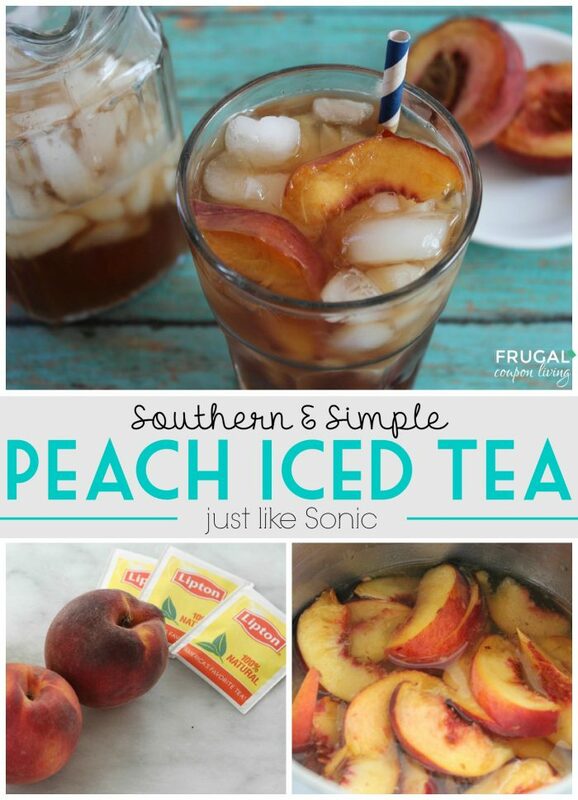 We love a tasty fruit iced tea recipe. 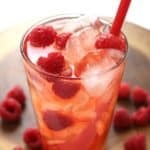 This homemade easy raspberry tea has a few simple ingredients. Ice and serve as a summer drink! Tea. 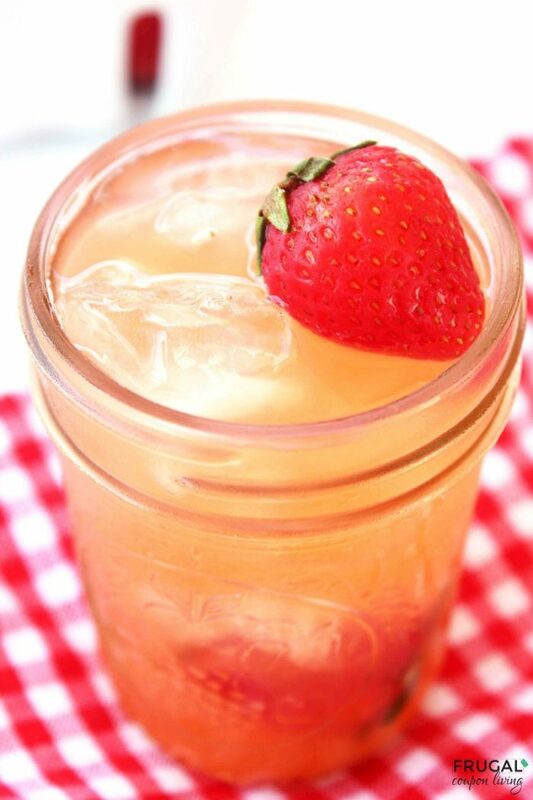 We have transformed many teas into tasty summer drinks including our popular Peach Iced Tea and forever favorite Strawberry Sweet Tea. 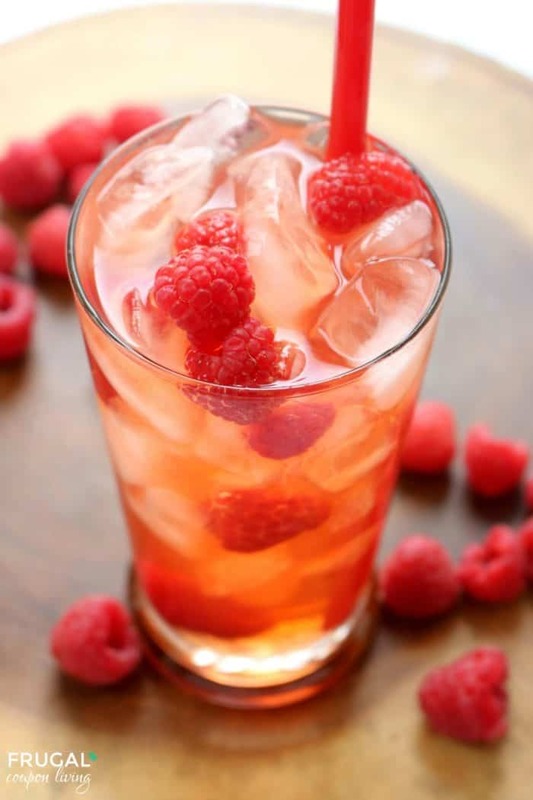 This week we have one more, our Easy Raspberry Tea. 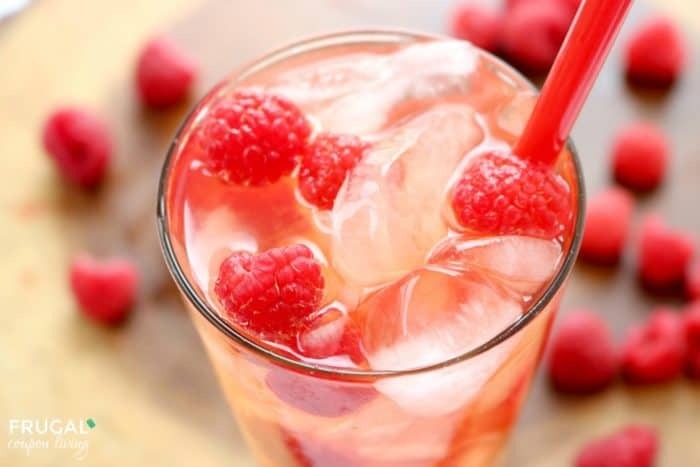 With a three simple ingredients, this raspberry iced tea is going to be a family favorite. Supervised by an adult, it’s so simple your kids can make it too! Bring 4 cups water to a boil. 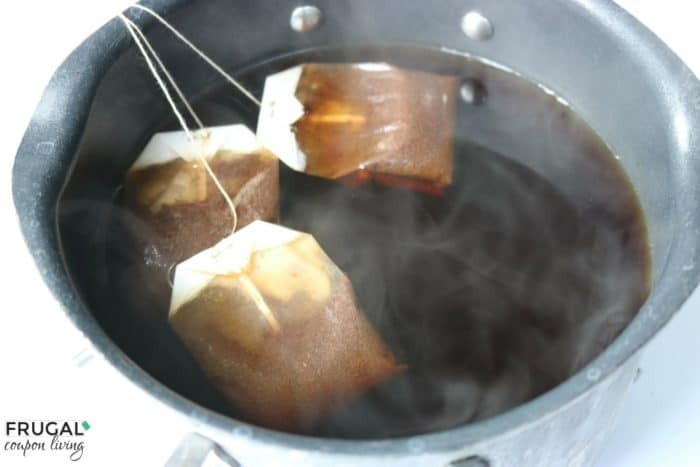 Add tea bags and allow to steep for 15 minutes. Add 4 cups water to medium pan. 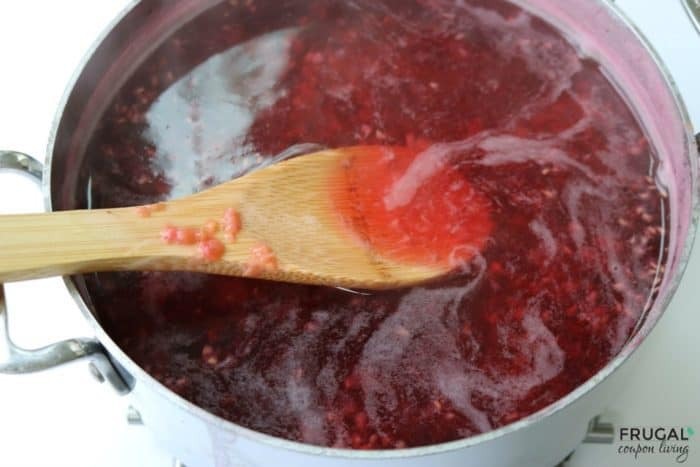 Add sugar and raspberries and bring to a boil over high. Reduce heat to medium and squish raspberries while continuing to cook for 10 minutes. Remove from heat and strain through cheesecloth or strainer, discarding berry pieces. Combine both in a large pitcher and serve over ice. 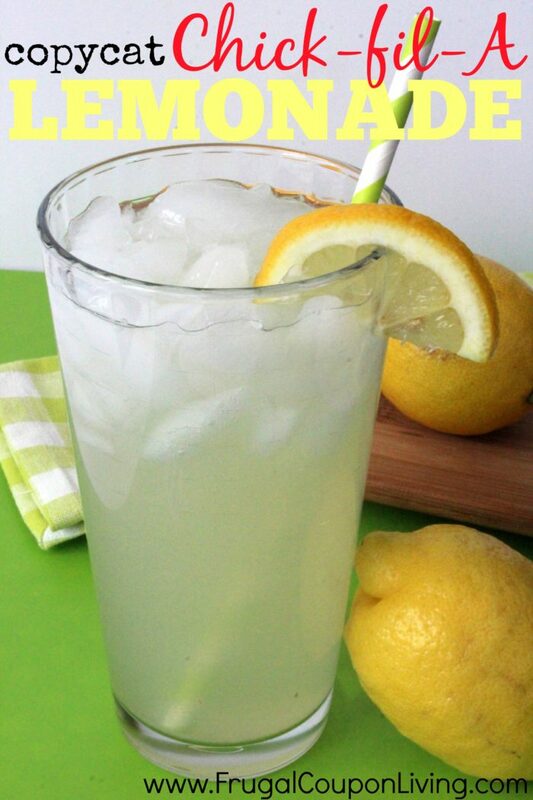 Lastly, we love copycat summer drinks. 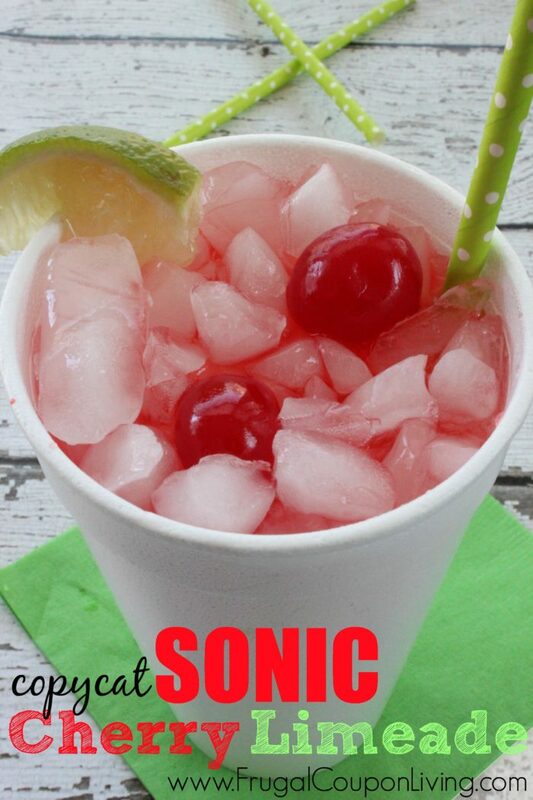 Take a stab at this easy to make Sonic Cherry Limeade Recipe. Pin to Pinterest. 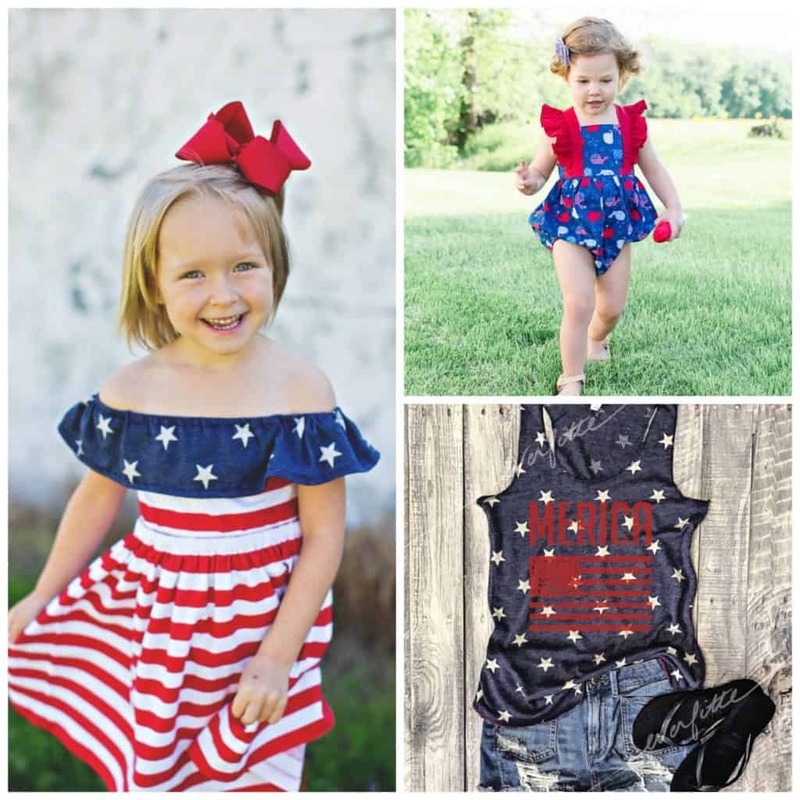 Looking for cute, patriotic outfits for the family to wear for the 4th of July? There’s still plenty of time to shop before the holiday, and we have Fourth of July Tops for the Entire Family from $13.99 and Other Etsy Finds for you. 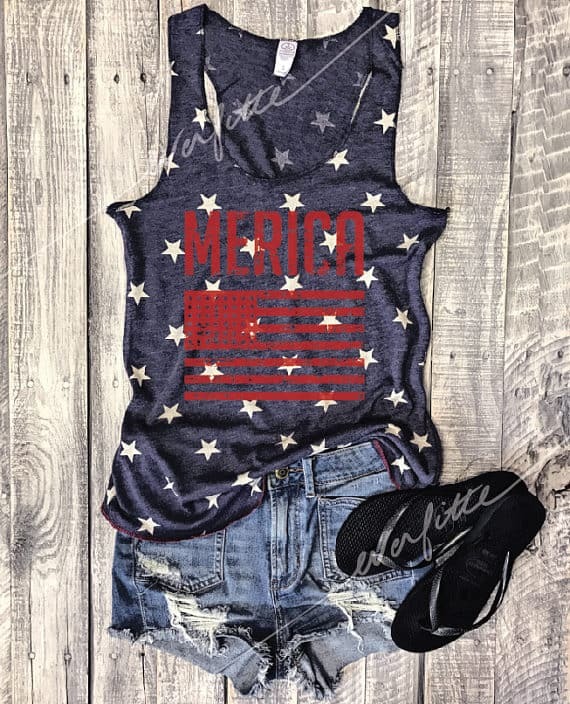 I love this washed “Merica” tank with its faded look and white stars. This would look great with anything from jeans and shorts to denim skirts. This is priced at $27. 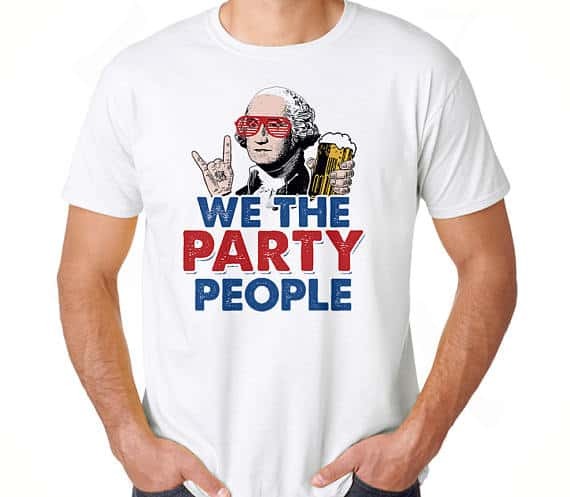 Everyone you see will get a kick out of this hilarious We the Party People t-shirt. My husband would love this and wear it all the time, and I love that it’s just $13.99. 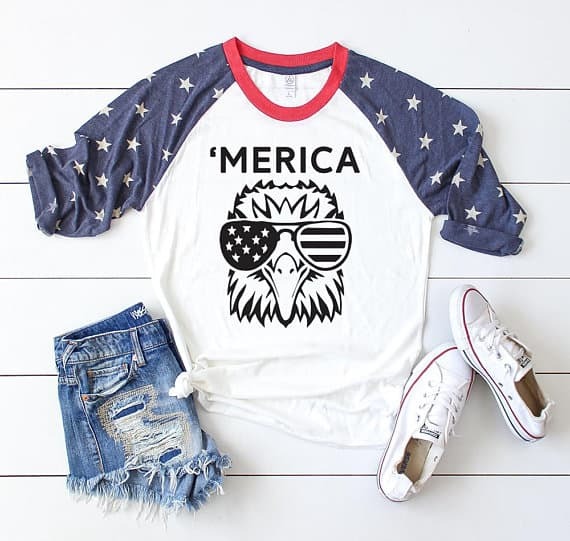 If you prefer raglan-style shirts, you’ll love this “Merica” top with a cute eagle wearing sunglasses and stars on the sleeves. Get this for $28. 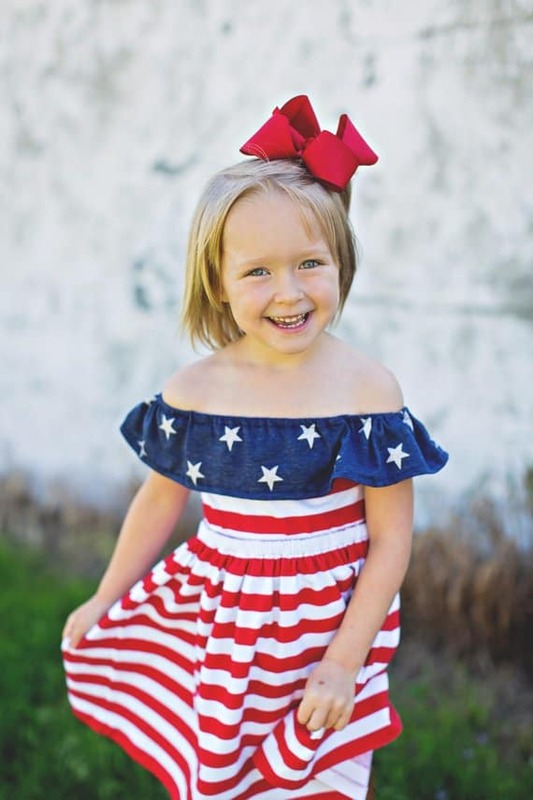 Oh my word – this stars and stripes Off the Shoulder Dress for girls is TOO cute for words. My daughter would LOVE this. Your daughter could also wear it as a tunic over jeans. This is priced as low as $32.50. Love embroidered tees for the kids? 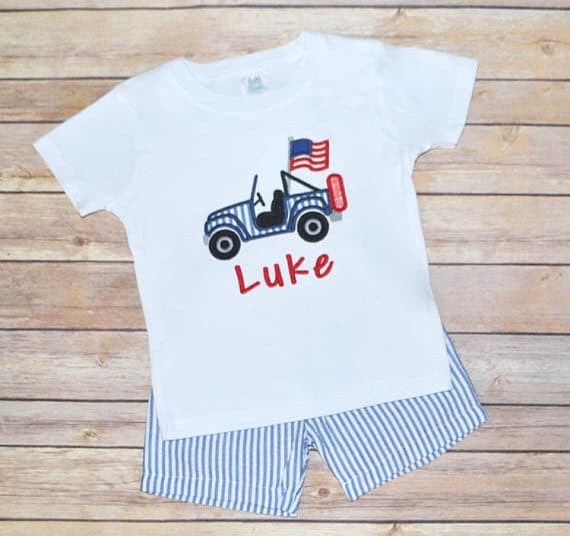 Little boys will love this Fourth of July Truck Outfit that comes with a cute tee that can be personalized with your child’s name as well as cute blue seersucker shorts. Get this for as low as $22. 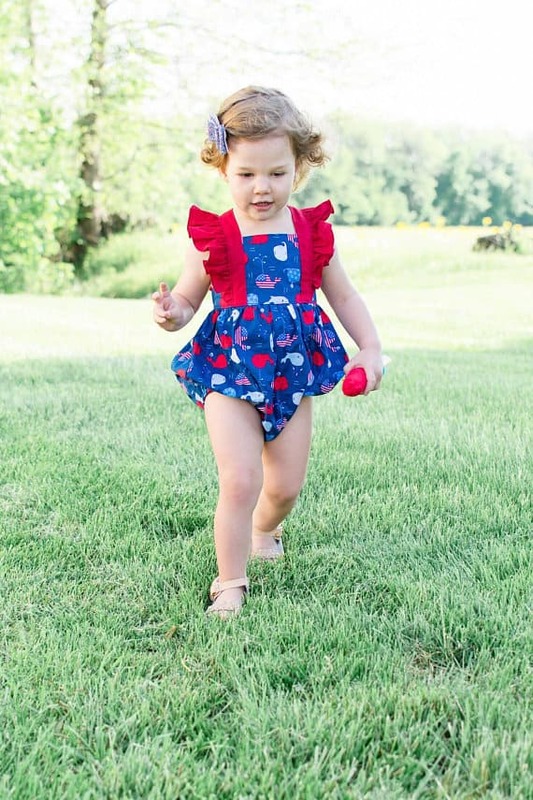 I’m obsessed wtih bubbles, and if you have a baby or toddler girl, she will look SO cute in this adorable Patriotic Bubble Romper. You can get this for just $45. 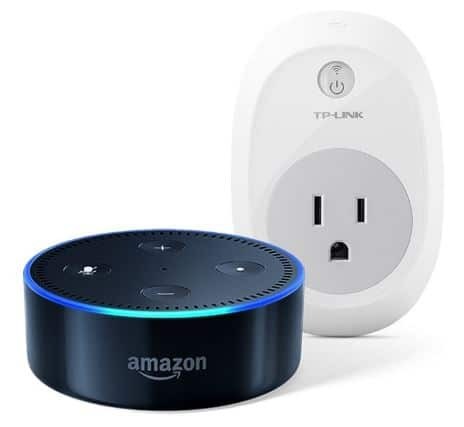 My husband and I been wanting an Echo Dot for our bedroom and a smart plug so that we can control the lights without getting out of bed, so this bundle is just what we’ve been wanting at a price point that fits in our budget. Today only, you can get this bundle with an Echo Dot and TP-Link Smart Plug for just $50.98, down from $90. My goal is to have one of each of these in every room in our house so that we can control our lights, thermostats and other things just by speaking. We already have one Echo Dot, and it gets used a lot. You can use it to play music, get answers to questions and so much more. It even tells jokes! I love linen pants because they’re lightweight and perfect for the summer heat. These trendy linen pants come in a variety of colors and can be cuffed or not. Get these for $18.99, down from $40. The gauzy linen gives these pants a beachy vibe. They have a billowy tie-waist pants, ideal for slipping over a swimsuit and perfect for transitioning to the bistro afterward with a tee or tank. Fold and roll for a boho vibe, or let them flow for a classic look. These will be your go-to pants this summer, and you’ll want them in every color.